But help could be at hand from a surprising source: electric vehicles. By electrifying its motoring, Australia would boost demand for renewable energy from the grid, while smoothing out some destabilizing effects that the recent boom in household solar has had on its energy networks. Australia’s electricity infrastructure was built largely without renewable energy in mind, and primarily to maintain reliability for when demand peaks. The high uptake of solar panels, while good for reducing carbon emissions, has reduced grid demand by 5-10 percent in Australia, and as a side effect has lowered the value of network assets, raised power prices and made the grid trickier to manage. Electric vehicles can ease the pressure on spikes in electricity prices by adding storage capacity. They are effectively a distributed storage system — with smart meters, they can feed electricity back into the grid when prices are high. These vehicles’ battery reserves thus can help with the balancing of the grid and provide energy in the peak period. Electric vehicles also would add battery storage to the grid at the same time, which can reduce the need to size the grid for demand peaks. One way to think of electric vehicles is essentially as batteries you can drive. So before the government pursues plans such as spending $1.52 billion on expanding the Snowy Hydro scheme, it should do a cost-benefit analysis comparing the returns from similar infrastructure investment in electric vehicles. 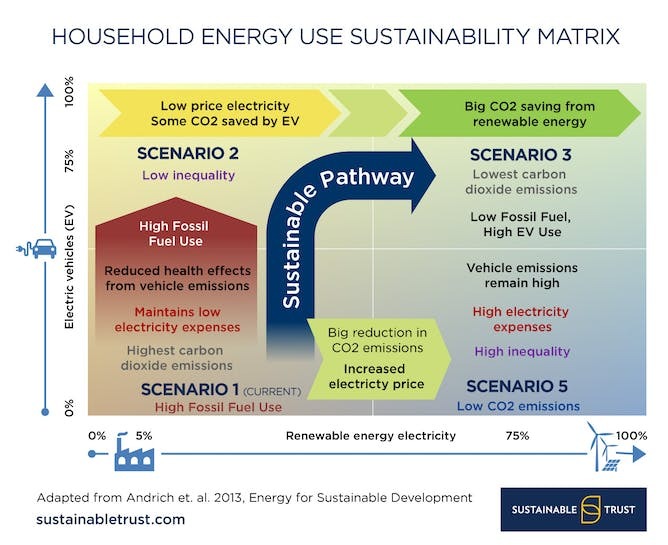 EVs aren't affordable for lower-income households, ironic given the benefits they would offer in terms of fuel budgeting and reduced exposure to urban pollution and health costs. According to the Office of the Chief Economist (PDF), Australia produced 6 billion kilowatt-hours of solar PV in 2015 — enough to run almost 2 million cars, equivalent to 10 percent of Australia’s total current passenger vehicle fleet. Increasing demand for grid-sourced electricity will put downward pressure on network prices, which typically are roughly half of the cost of a household energy tariff. At a time when demand has declined and policy settings have created lots of investor uncertainty, the increased demand also will encourage investment in new generation capacity. Electric vehicles also can increase economic activity in Australia and improve air quality and health. Australia has nearly 20 million cars that together drive 174 billion miles each year. Passenger vehicles alone consume 20 billion liters of fuel each year in Australia. At $1.14 per liter, that is $22.82 billion per year that is burned, with roughly half the revenues going to multinational oil companies and the other half going into federal coffers as fuel tax. The health costs of pollution from vehicle emissions adds a further $1,103 per household per year in major cities, an annual impost of some $11.03 billion on household and government budgets — roughly the same as what the government earns in fuel tax. If all vehicles were electric, the same distance could be driven with electricity costing less than $11.41 billion, because electric motors are more efficient than internal combustion engines (although this is slightly offset by minor grid losses). This would deliver a double saving, in terms of both household fuel bills and reduced health costs. Of course, this won’t happen overnight, but that’s not necessarily a bad thing. The electricity grid will need time to adjust and add extra renewable capacity, as the cost of electric cars comes down and coal power stations get old. Here is where electric vehicles really can help the grid. Swapping petrol or diesel cars for electric ones on a large enough scale will increase Australia’s flatlining electricity demand, making it more lucrative for energy suppliers to invest in new generation capacity. Given the increasing cost of gas and the declining support for coal, on balance most of this demand will be met with new renewable capacity, facilitated by the addition of all these new "batteries you can drive." Government policy should be to set some high-level national interest objectives, such as maintaining gas for domestic use, and then simply not interfere with the market as much as possible. But political leaders are struggling to keep up with the rapid changes in technology and the market. The pathway to sustainability would have been smoother and faster if governments had looked to Western Australia for a gas reservation policy, not intervened by closing coal and reduced the subsidies that allowed solar power to grow so disruptively fast, particularly in wealthier households. Making more effort to promote electric cars also would have allowed a more successful transition to renewable energy and reduced the price shocks being suffered by eastern Australia in areas such as the gas market. Fortunately, it is not too late. Investing in a new car is not a decision most households take lightly. This is especially true of electric cars, which are expensive, are not marketed widely, are available in only a limited range of models and are subject to concerns about charging and range. Meanwhile, electric cars have an undoubted cool factor. Buying one is a powerful way to show you care about your community’s future. Just look at the way Tesla founder Elon Musk sparked the debate over South Australia’s electricity problems. For governments, electric vehicles offer an opportunity to make significant inroads on environmental and health problems, not to mention urban planning and infrastructure. The demand for car batteries also could boost related industries, such as lithium mining, in which Australia is a world leader. Simple, inexpensive policies could encourage electric vehicle uptake, such as reducing registration fees and stamp duty on electric cars and allowing them to drive in bus or other priority lanes, while also hiking the tax on diesel cars that cause cancer (PDF). Other emerging transport trends, such as car-sharing clubs and ride-sharing apps, also could hasten the uptake of electric vehicles. Sharing increases the number of miles driven by each individual vehicle, meaning that the upfront costs are paid back more rapidly, leaving the owner with a car that is paid off and cheaper to run than a petrol or diesel model. These facts are not lost on the car manufacturers themselves. But given the potential co-benefits to the electricity grid and community health, we might expect power utilities and health agencies to join the push to actively promote electric vehicles — not to mention politicians looking to deal with our energy issues and win a few votes along the way.